Scientists say they are witnessing a planetary system being formed for the first time. The team from the University of Toronto found that gaps in a disk of dust and gas around a young star were actually made by forming planets. This is all taking place in the Taurus constellation, which is 450 light years away from planet Earth. The picture of the young star, which is less than a million years old and is known as HL Tauri, or HL Tau for short, was taken by the ALMA telescopes in Chile in October. "HL Tau likely represents the first image taken of the initial locations of planets during their formation," said Daniel Tamayo, who led the team. 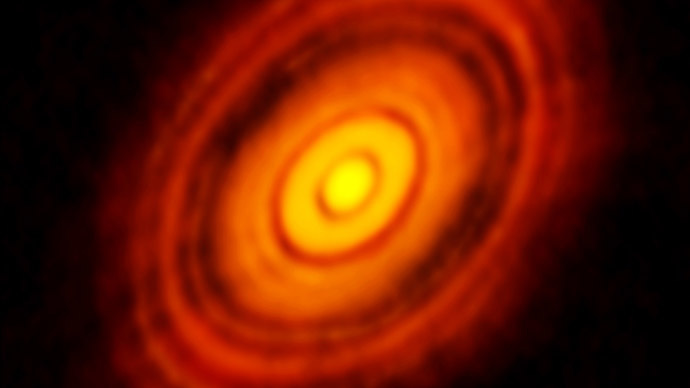 "This could be an enormous step forward in our ability to understand how planets form." Critics who viewed the original image, said the outer three gaps could not have represented forming planets because they were too close together. Astrophysicists argued that if the planets were so big that they were able to carve such gaps, they would be scattered violently by the force of gravity, which would lead to them being ejected from the system. However, Tamayo and his team suggest the gaps were caused by planetary formation because, “the gaps are separated by amounts consistent with what's called a special resonant configuration,” the scientists stated in a public release. This means that the planets were able to avoid violently colliding with one another because they each had a specific orbital route, which would make sure they missed each other. This is similar the orbits of Pluto and Neptune in our solar system. Their orbits have crossed for billions of years, but they have never crashed into one another. HL Tau isn’t visible to the naked eye though as it is covered by a thick cloud of gas and dust. Therefore the ALMA telescope was able to detect the image by the ALMA telescopes, which are spread apart from each other, using longer wavelengths. This allows it to take images with much higher resolutions. Tamayo adds that HL Tau, although stable at the moment, will eventually become a “ticking time bomb,” which will mean some planets will be ejected from the system, with the others maintaining an elliptical orbit. “Our solar system does not seem to have undergone such a dramatic scattering event,” Tamayo said. “Future observations could also go a long way in determining whether our solar system is typical or an oddity ideally suited for life,” he concluded.